If you are a businessperson, that means customer loyalty is a top priority in your mind. This also means you understand and appreciate the impact customer support can have on the success of your business. It doesn’t make a difference whether your business is new or has been in the trenches for years and years, there is always room to improve customer support. Just a heads up, it is important not to confuse customer support and customer service. 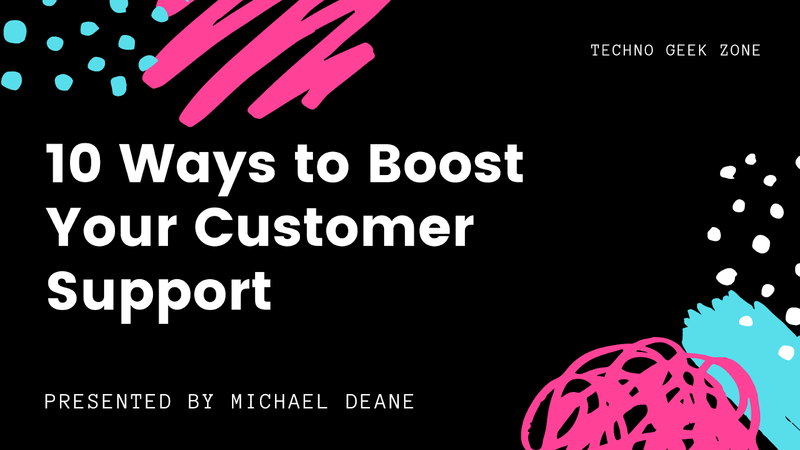 Both customer support and customer service are about helping customers, except customer support is a specific type of customer service, more related to documentation, technical support, and product feedback. Let’s talk about some simple, but effective ways to boost customer support, and ultimately, build customer loyalty and the strength of your business. Whether you are offering customer service or customer support, it is critical that you understand your product or service. In the case of customer support, you won’t be able to dish out much support if you don’t understand how your website or the mobile app works, for instance, can you? Let’s say a customer is having an issue with navigating an app. Providing you have the right knowledge of your product, you will be better suited to ask the right questions to get them through the appropriate steps as seamlessly as possible. Whether you are dealing with customers via phone or email or face-to-face, they should be met with warm greetings and a willingness to help them solve their problems. Customer service focuses on the transactional side of things. Customer support, on the other hand, is all about improving upon the experience. Considering the importance of customer support to your business, it is best not to leave things to chance. Having a level of expectancy helps not only your team but also your customers. Providing top of the line support to customers can make all the difference for your business. There are actually simple steps you can take to achieve this level of support such as promptly responding to queries. Once the information is collected, this is passed on to the Product team. The aim is to review feedback, identify areas for improvement, and make changes to your product or business accordingly. You are essentially using customer feedback to refine the experience customers have used your product. There is no doubt that chatbots are on the rise. Tons of companies are already using this technology to handle menial tasks and reduce the cost of operations as well as streamline the online part of the daily business. Human agents dealing with customers via live chat is one thing. Chatbots, on the other hand, come with a few benefits that are worth making a note of. For one, human agents need sleep. You know, being human and all. Chatbots, on the other hand, don’t, for obvious reasons, meaning you can offer support to customers regardless of time zones, or any other time-related obstacle that may limit human agents. There are a few things more irritating than scouring a website trying to figure out how on earth a company expects you to get in touch with them. This can result in customers bouncing from your website altogether. Customer support is crucial to your business. If customers have a hard time simply initiating the process, it sends the wrong message. Assuming your the business has a website (as it should), including a FAQ section can save you a lot of time as well as customers. It’s likely that people will have tons of questions, and sometimes these questions are the type that your team receives every day. By gathering as many Frequently Asked Questions as possible, you can help set customers on the right track before they even interact with an agent or rep. Start by asking your team what questions they receive most often. In a sense, the customer support process begins before you even engage a customer. That said, it’s important that people know exactly how and when you are available. Clearly display this information on your home page, contact page, or Google listing, etc. Being caught off guard by queries put in by customers is not a good look. Once customers are facing some kind of difficulty and contact you for help, the ball is in your court. Be prepared. It is recommended that you have resources related to your service/product ready to go.